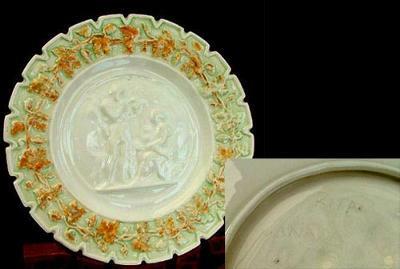 The plates are quite pretty and certainly seem to have some age to them. They are cream and green with very pretty autumn leaf borders and a raised centre. The underside of each plate has the words RITA and CANADA etched into the porcelain. Can’t really find out anything about them and was wondering if anyone could help me out with some details and maybe a date. Not sure if they are antique or maybe just vintage. I’m sorry but those aren’t my plates. They look like they are slip cast and I only do wheel thrown work. I wish I could tell you whose they are, but I’ve never heard of Rita Canada work. Your studio pottery plates are probably by Rita McGie, a Canadian Potter Based near Alberta in Canada.